The Cleanroom Performance Testing Program provides for certification of firms and qualification of individuals that meet criteria established by NEBB. The purpose of NEBB certification is to offer tangible proof of competent firms and certified professionals qualified in the proper methods and procedures for performance testing of cleanrooms and/or cleanspaces. Establish industry standards, procedures and specifications for performance testing of cleanrooms. Set minimum education standards and other requirements for the qualification of certified professionaly personnel employed by firms who perform this work. Establish educational programs for training certified professionaly personnel in the proper methods and procedures for performance testing of cleanrooms. Certify as qualified for the performance and supervision of cleanroom performance testing, those firms who meet the requirements for certification as established by NEBB, who agree to comply with the objectives of NEBB, and who employ certified professionaly personnel who have met the requirements of qualification as established by NEBB. Serve as a focal point for educational and technical materials pertinent to cleanroom testing. 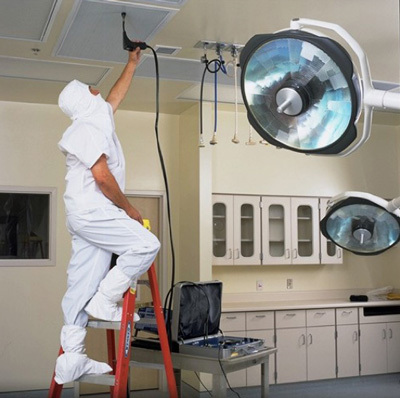 Be a cleanroom testing contractor. Enjoy a reputation for responsible performance. Letters of endorsement from consulting engineers, architects, and owners are required. Possess the various instruments listed herein which are required for certification. Possess the current NEBB Procedural Standards for Certified Testing of Cleanrooms. Have a high school diploma, or equivalent, a minimum of three (3) years experience in cleanroom performance testing, and have passed a Cleanroom Testing Study Course approved by the NEBB Cleanroom Certification Committee. Demonstrate knowledge in Cleanroom Performance Testing by passing appropraite written and practical cleanroom examinations. Continue to own the instruments required for certification which they had listed. Submit records to verify their conformance with the NEBB guidelines for calibration and maintenance of the required instruments. Confirm in writing that they employ the designated Cleanroom Performance Testing Certified Professional(s) who previously met the NEBB requirements for qualification. Confirm in writing that the designated Cleanroom Performance Testing Certified Professional(s) has attended at least one six (6) hour approved seminar or refresher course annually given by Chapters or at National meetings of NEBB, IES, SEMI, ASHRAE, or by other approved organizations or institutions. A firm’s certification shall be suspended when the firm no longer meets all of the certification requirements listed above. The certification of a suspended firm will be reinstated by NEBB at such time as the requirements for certification are again met. A certified firm must notify the local NEBB Chapter in writing within ten days of the temporary or permanent loss of the designated NEBB-qualified certified professional. Replacement of certified professionals is not permissible without written approval of NEBB. Certification may be terminated for failure of the firm to abide by the objectives and performance standards of NEBB. Termination of certification by NEBB requires vote of the Board of Directors of NEBB provided that by similar vote the Board shall first find that certification is prejudicial to the best interests of the Bureau and provided further that the certified firm in question shall have had opportunity upon written notice of at least fifteen (15) days to show cause why the certification should not be terminated. Trade name used for descriptive purposes only. Instruments of equal capability are acceptable.